Often times, when we think about reaching out to other parts of the world, we tend to focus on the same demographics: The orphans, the poor, and those in need of medical attention. And though I think that helping these people is a necessary part of our faith walk, I also understand that they are not the only people in need. Unfortunately, here, just like in the U.S., many of the the short-term volunteer groups who come tend to overlook the same demographic the church overlooks in the U.S.: Young Adults and Young Professionals (age 18 – 35). The fact is, this demographic is “searching” just as much as everyone else. So, just as I have a heart for the young people at home, it seems only fitting that I’m a part of a team whose focus is to spread the Word through music and by engaging the young people and musicians in this city. Quite candidly, any Caucasian American who walks into this society is automatically going to get a ton of attention. The general public is anxious to talk to them about America as well as share about the local culture. This “rock star” attention is exponentially magnified when that same person actually gets on a stage and plays cover songs from ColdPlay, Snow Patrol, The Beatles, and John Mayer. (I don’t get any rock star attention since most of the locals think I’m from North India as I’m only a lighter shade of brown then the are, so I just hang out in back and take pictures.) That said, with a microphone in hand and a couple of worship songs in the set list, there are few greater opportunities to talk about your faith than this. And though we haven’t seen any mass revivals as of yet, we are taking the Word to places it is rarely ever taken. Fortunately, we have been blessed with two amazing escorts who have been setting up all the gigs for us…. Paul is a Worship / Youth Pastor who grew up here and runs a “hard rock / metal” music ministry throughout the city. He is very tied in to the local music scene and has opened doors for us that would never have been breached by an outsider. Max is also a local Worship Pastor who was a professional techno / trance club DJ and is now working with Paul and his ministry. Either way, though a lot has happened here in the past week and it seems like we’ve all known each other forever, it has only been a week. From that perspective, it’s important that we keep in mind that this is not a “sprint”, but more so a “marathon” of a trip and there is still a long way to go. Anyhow, today our performance was postponed to Friday afternoon (now we have two shows on Friday), so we decided to do some additional team building and play some cards / watch some movies. On top of that, we were able to set up a visit to the Children’s Home Orphanage for this Saturday prior to our Saturday Night Show. 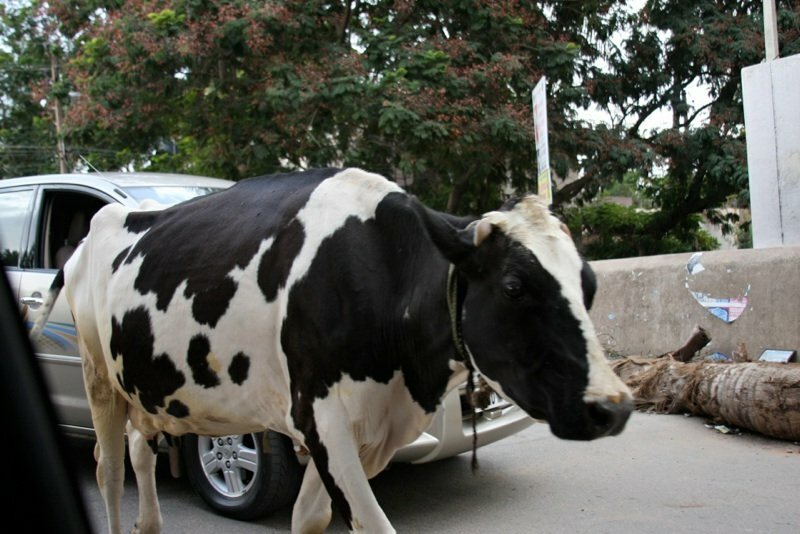 The picture above is of a random cow in the street… just for fun.